I recently learned (due to a whim of curiosity during the morning commute, and the availability of Google at all times of day, except for one stretch along said commute which has no mobile phone signal) the difference between mist and fog. Fog, apparently, is ground-level cloud, while mist is something that rises from the ground (or bodies of water). Now, every time I see one or the other I have to hesitate for a moment while my brain refreshes and I remember which is which. Currently, this is every morning – it’s been a misty winter so far. Our rainfall for June was slightly below average, May was about average, and April was almost double the average (69 mm against an average of 36 mm for the month). It’s an unexpectedly wet winter for what was predicted to be an El Niño year (although the current outlook says it’s El Niño neutral in the Pacific ocean, with a negative Indian Ocean Dipole emerging -0 all of which indicates that we should expect average or above average rainfall); our rainfall for the year to date has been 496 mm, and the annual mean is only 663 mm. I’ve always been interested in weather and climatic patterns. In primary school I learned what the different types of clouds look like and what they mean, and how to read a weather chart (high pressure systems, low pressure systems, fronts, etc. ), which was fascinating. As an aside, I seriously think that geography/social studies for kids should include this stuff, and I think it’s real shame that the current Australian curriculum doesn’t. I remember being bitterly disappointed with social studies (aka history/geography mashed into one subject) when I arrived in Australia at age 12 and started school here. Having a farm makes that interest more personal. Having a farm with no mains water connection makes it deeply personal. The length of my showers and my decision to put in a composting toilet rather than a water-guzzling flush toilet (the average Australian toilet uses about 20,000 L of water per year in flushes) have a measurable effect on how much water I have left for everything else for the summer – and I get to decide how to best use that water. In a dry(ish) climate like ours, water is life. Where there is water, plants grow and animals (and people) thrive. This is fairly obvious to anyone who’s experienced our baking hot summers. Gallifrey isn’t on mains water, so even if we wanted to use the output of the dams and the desalination plants, we can’t. The water in the deep aquifer is fully allocated for agriculture in the area, so we aren’t allowed to sink a deep bore or well. 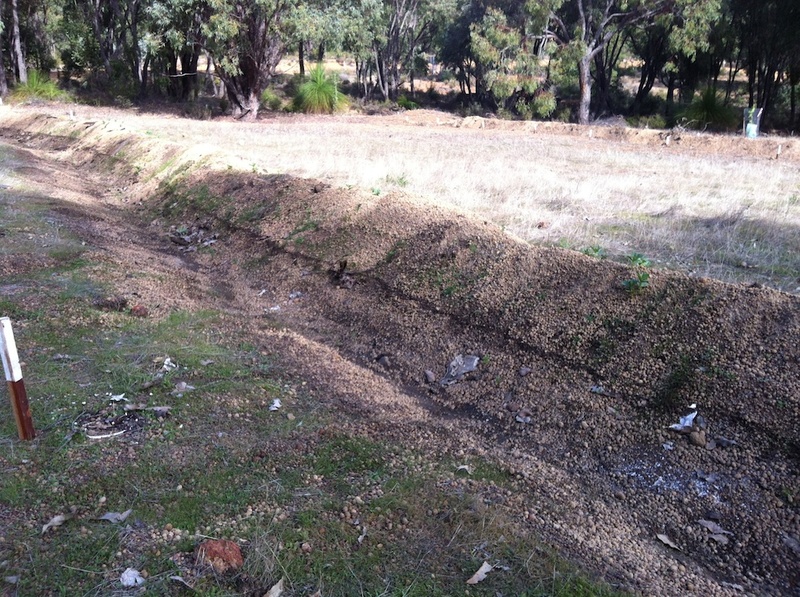 We are allowed to sink a shallow bore, and according to our neighbours the water isn’t saline, but drinking water from the shallow aquifer isn’t recommended – “not saline” has a variety of meanings in WA, and most of them aren’t good for human kidneys in the long term – and it’s a horribly unsustainable use of the resource. So we’re basically reliant on rainwater. That’s not as bad as many people around Perth seem to think. We get 500 – 700mm of rain per year; the official average is closr to 700mm, but the real current average is closer to 600mm, or 500mm in a bad year. That’s a lot of water if you have tanks to keep it in. Easily enough to live on, and keep a kitchen garden going if we’re careful. Water tanks, though. 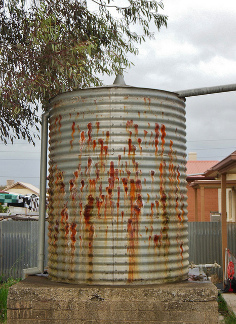 In WA, people seem to buy either plastic water tanks or Aquaplate steel tanks. Aquaplate is galvanised steel with a plastic membrane bonded ot the inside, for those who don’t know. Neither of these options appeals to me. I know that the plastic is food grade, approved by all the regulatory bodies, but I just don’t like the idea of long term water storage in plastic. How many years did we have BPA in most of our plastics before we discovered that BPA is seriously toxic? Plastic is too new a material, and there are too many potential toxins, known and unknown, for me to be comfortable with plastic being in direct contact with all my drinking water. Call me a conspiracy theorist – and if nothing toxic has been discovered in these plastics in 30 years, I’ll say you were right. Plastic tanks also have very poor fire resistance. Since we are in a bushfire prone area, that’s also a factor. So, you can also buy old fashioned galvanised steel tanks without the plastic liner. It’s unusual, but you can get them. These are well known for being unreliable – they corrode and spring leaks very quickly. And they’re plated with zinc, which probably isn’t ideal for drinking water either. 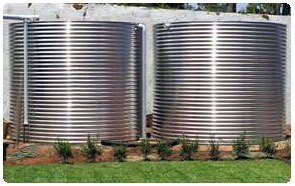 If you’re prepared to get fancy, you can buy concrete tanks, either precast or poured in place. These tanks are massive, and once the concrete has cured they don’t leach anything more dangerous than some lime into the water (which changes the pH of the water, but not significantly). However, concrete isn’t 100% waterproof – water molecules wick their way intot he concrete unless you use toxic admixtures to waterproof the concrete or put a plastic liner inside the tank. These water molecules aren’t a big deal – you don’t lose much water that way – except to the steel rebar with which concrete tanks are reinforced. Water causes steel to rust, and rust takes up more space than the original steel, and then you get cracks. Which allow more water in, which causes more rust, which causes more cracking. Of course you could use something other than steel to reinforce the tank structure – but no one does. I have no idea why not. Concrete tanks can also crack due to the temperature differential between the inside of the tank, which is cool and wet, and the outside of the tank which is exposed to sunlight. There doesn’t seem to be any way to get around that except shading the tank, and possibly insulating th eoutside of it. The final commonly used material for water tanks is stainless steel. The stuff your kitchen sink is made out of. It doesn’t corrode (well, it does, but very slowly, giving it a 40 – 70 year lifespan), crack or leak, and it doesn’t leach toxins into the water. It’s durable, and although the seals (usually made from equally inert silicone) can be damaged by fire, the tank itself shouldn’t be harmed. 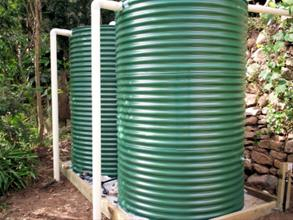 It’s not even much more expensive than a plastic or Aquaplate tank, and can be less expensive than a concrete tank. But.. it’s completely unavailable in WA. The manufacturers of stainless steel tanks have failed so miserably to tell the public about how much better their product is than the competition that a lot of them don’t get enough sales to keep them in business. Certainly not enough to encourage other people to get into the business. There are two manufacturers in QLD, and another two somewhere in NSW or VIC, and one in TAS. None of them are willing to even give me a quote to ship or freight a tank over to WA. There used to be two manufacturers in WA, maybe more, but they went out of business. Not enough interest in a product which is clearly better than the alternatives, with a longer lifespan. People just don’t think of stainless steel, or if they do think of it they assume it’ll be impossibly expensive. That is what I call a failure of marketing. Also, very frustrating. Not sure yet what the solution is. No scheme water, and no bore or rainwater tanks in place, made irrigation over the summer a very labour intensive task. 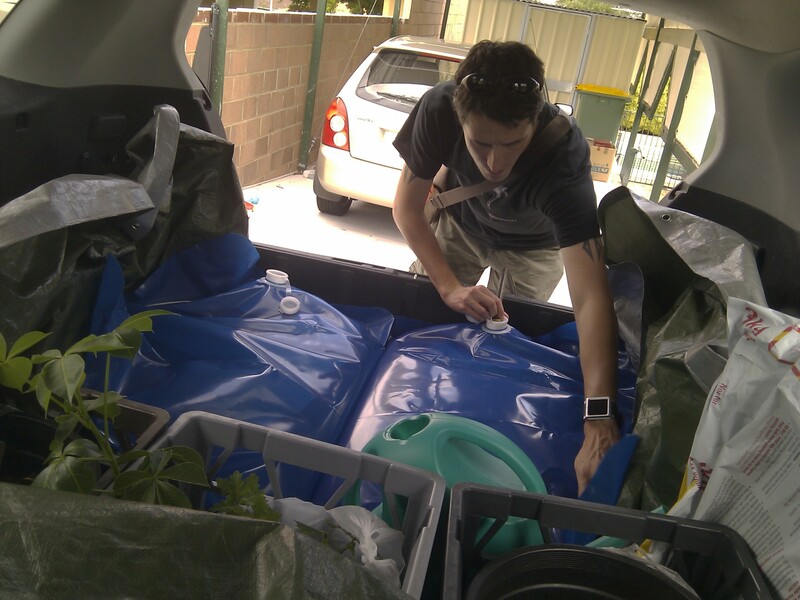 So every weekend we filled up a couple’ve barrels with water and drove them up to Gallifrey, then manually transferred the water to the water tubes around each of the trees using watering cans. We tried a few water containers, and experiment showed that the recycled plastic olive barrels fitted with taps were the best. The flexible plastic water bladders that we tried first didn’t hold much water, and sprung leaks after two or three uses. The plastic slimline rainwater tank from Bunnings was better, but the lid didn’t seal, and the tap attachment wouldn’t take a regular hose, meaning that we had to siphon water out from the top. Slow. 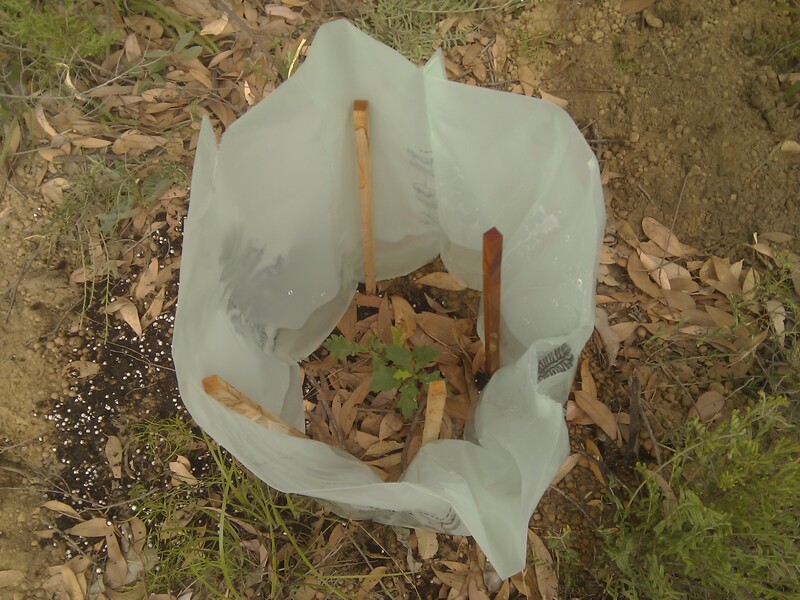 It could have been worse; our neighbour thought we were manually watering each of the tree seedlings every weekend. The water tube tree guards were a life saver; they’re UV resistant plastic tree guards with a built-in 20L water bladder and a dripper in the base. The water drips out slowly over (in theory) 2 weeks. In hot weather the water in the water tube expands, forcing the drip rate to increase, while in cooler weather and at night when the plant requires less water the drip rate decreases. So far, we have four fig trees (Ficus carica), all different varieties, two pomegranates (Punica granatum), a natal plum (Carissa macrocarpa), an acerola cherry (Malpighia glabra), two honey locusts (Gleditsia triacanthos), a baby boab (Adansonia gregorii), three kei apples (Dovyalis caffra), and four moringas (Moringa oleifera) planted. Those are the food trees. Yes, boabs count as food trees. There are also two oak trees (Quercus spp., acorns collected from Stirling Gardens in Perth), a dieback resistant jarrah seedling (Eucalyptus marginata) that a friend gave us, a few dozen wattles, mainly Acacia victoria, but also some Acacia acuminata and Acacia pycnantha, a few pink siris (Albizia julibrissin), and one or two black locust trees (Robinia pseudoacacia). 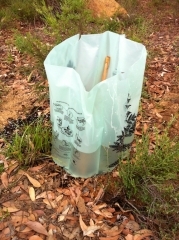 The plan is to plant a shelter belt around the entire perimeter, inside the mandatory firebreak, consisting of thorny natal plum, kei apple, boysenberry (Rubus x boysenberry) and sea buckthorn (Hippophae rhamnoides), as well as fire retardant trees like oaks, maples, sweetgum, hazel and prickly pear. Eventually, it will be a noise buffering fire barrier in the form of a hedgerow. Inside that will be a secondary firebreak, planted with grain and meadow plants in winter, and space loving succulents and vegetables like squash in the summer. Inside that will be the forest, and the house.